+Joseph Ndungu , a member of +GDG Kimathi University and one of thematic lead, has build a web application that assists you to manage both your movies and series. 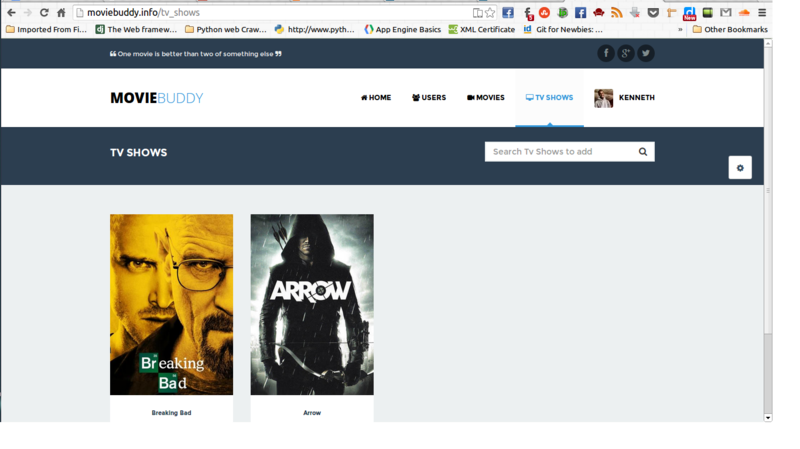 Movie buddy allows you to add all the movies that you enjoy and can rate them. Humans are inherently social beings which is why he made it possible for you to see your friends of Google Plus and Facebook. Where as there is the o-auth for the application, You can use Google Plus Sign in or Facebook Sign in. The application has become popular and awesome to use. Joseph says that the beta version might have an Android Application which you can use to add movies from the comfort of your smartphone. We support and endorse more innovative ideas to come from our GDG and Movie Buddy is one of those great ideas that we are proud of as GDG Kimathi University.